Striders vice-chairman Dan Wilson is taking on a marathon challenge this Sunday to continue in his fundraising efforts for Harrogate Hospital. He’s inviting all Striders to join him in his attempt to crack the 26.2 mile distance for the first time. Run one, two or more laps of The Stray and help raise money for Harrogate Hospital and Community Charity. Attempt 13 laps for a full marathon! This is an open event starting at 10.00am inside the main entrance of the hospital. Parking is free on surrounding streets or you can pay at the hospital car park. Dont forget to make a donation or buy a cake from the cake stall and pick up your free celebratory certificate from the hospital when you finish! Please note THIS IS NOT A FORMALLY ORGANISED EVENT. You are welcome to turn up and run but this will be at your own risk. No first aid or changing facilities will be available. 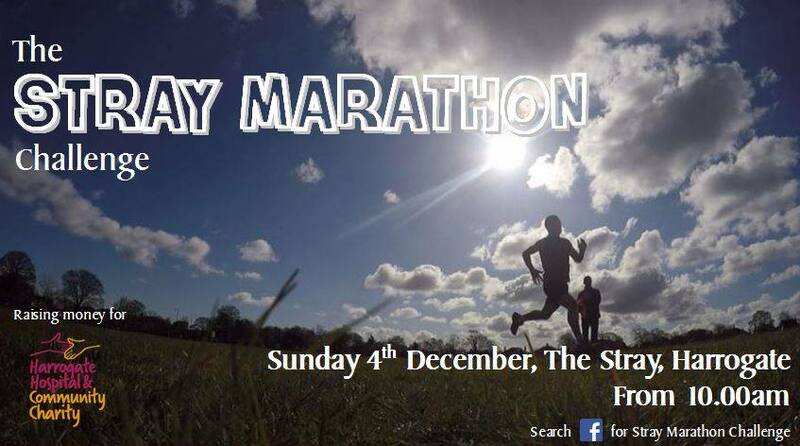 Come on Striders – lets give Dan a big support on Sunday and test yourselves to run as many laps as you can. Yes it really is December tomorrow and that means the first Saturday of the month parkrun visit is this Saturday. We will be travelling to the CrossFlatts (Leeds) event which should give a little bit of a different parkrun to the norm as it has a flight of steps to get up! Meet at KCC for 07:50am (07:55am departure) for the car share or just meet us there. Plans for a bit of post parkrun breaky are underway! If you are going to the 1st PECO Cross Country race in the 16/17 series at Temple Newsam this coming Sunday (27/11) please try and collect your number from Eric on Tuesday evening at the club. These events are proving more and more popular so please car share where possible. If you can give or need or want to share please meet at KCC at 09.00 for a 09:05 departure. There is a note on the Club notice board to add names. Its worth noting that Presentations from the 2015/16 PECO XC season will take place after the run and Striders will feature in this! Note that Ladies will start 10 minutes after the men – all the info is on the PECO XC site here. Lets have a massive turnout folks! (P.S. – All those members interested in doing Yorkshires Northerns, Nationals, Cross Country evvents do contact me at earliest opportunity). This session will take place on the grass at the Cricket Club…so bring some XC spikes or trail shoes if you have them (along with a headtorch if you have one to hand). There are three Cross Country events early in 2017 that you may be interested in. On 07/01/17, the Yorkshire XC Championships will be held at Lightwater Valley Theme Park. Closing date for entries is 09/12/16 and the cost is £6. The Northern Championships will be held at Knowesley on 28/01/17 at a cost of £7. Closing date is 19/01/17. The National’s are in the diary for 25/02/17 and will be held in Nottingham at a cost of £7. The closing date for this event is 04/01/17. TO ENTER, please tell Eric, and give him the the Entry fee well before the closing date. He will take all your details from the clubs Membership list, but for the Yorkshire Championships will need to know how you qualify – either Yorkshire born OR you have held Residency in gods own county for over 9 months. At all events, Club Colours must be worn and you require an England Athletics Number. The quality/structured sesstion on Tuesday 15/11/16 will be road hills. Anyone else wanting to do Peco X-Country Race 1 at Temple Newsam on November 27th? If yes, please send an E-mail to eric_morley@hotmail.com by 21.00hrs on Saturday November 12th giving your name and date of birth and England Athletics individual number. I will collect £3 from you when I next see you for your race number. The club will be placing an order for kit next Sunday (13/11/16), so if you would like to order any new club kit yourself or perhaps family are looking for Christmas present ideas for you, please see the link below to take you to the latest catalogue (along with a link to the order form). Printed copies of the form are available at the club on a Tuesday or Thursday. This local race does not appear in the FRA booklet but is a great race to enter should you be considering some Fell running. The event is held on Saturday 12/11/16. Entry is on the Day and the venue is Scalebor Park, in Burley in Wharfedale. Fuller details in the EVENTS calendar.